You can get $350 when you open a new ATB personal chequing account. Open a new ATB personal chequing account between January 9 and March 31, 2017. For this account, set up:A recurring direct income deposit (payroll, pension or disability) and/or at least two unique recurring pre-authorized payments (bill payments, mortgage or loan payments, contribution to investments, insurance payments, or property taxes). Make sure the first deposit or each of the first payments go into or are withdrawn from the account by May 31, 2017. Each must recur at least once per month in each of the next two consecutive months. You can also get a $25 bonus when you open an eligible account online. Note: $350 and $25 bonus offers only apply to the following types of new chequing accounts: Unlimited Account, ATB Advantage Account, Students First Account, Freedom Account. 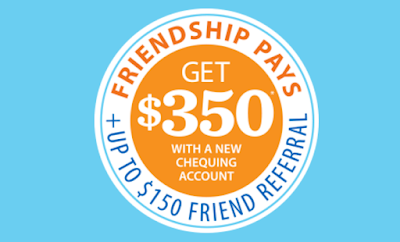 BTW, if you're an existing ATB personal chequing account holder, you get up to $150 for every successful friend referral. Please see the details from the above deal link.